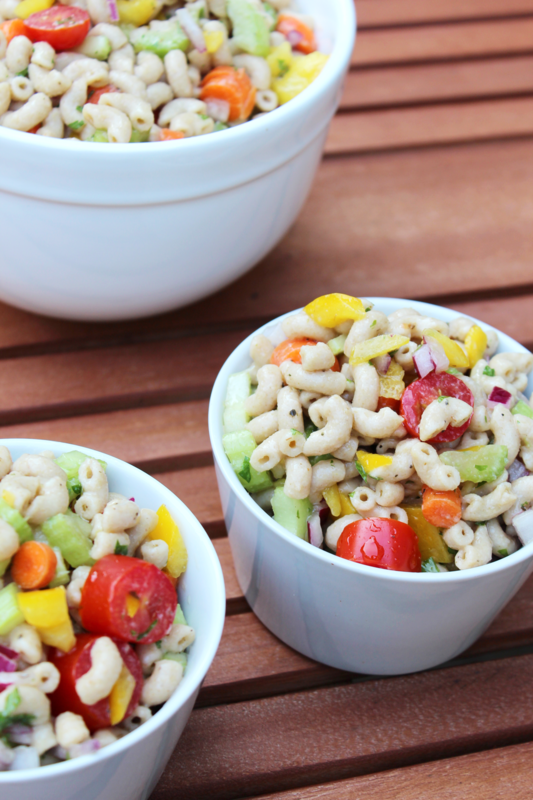 Pasta salad always seem to be offered as a side dish during the summer time, but let’s be honest, no one really gets a hankering for mayo-based pasta salads. It never seems all that glamorous of a choice either. 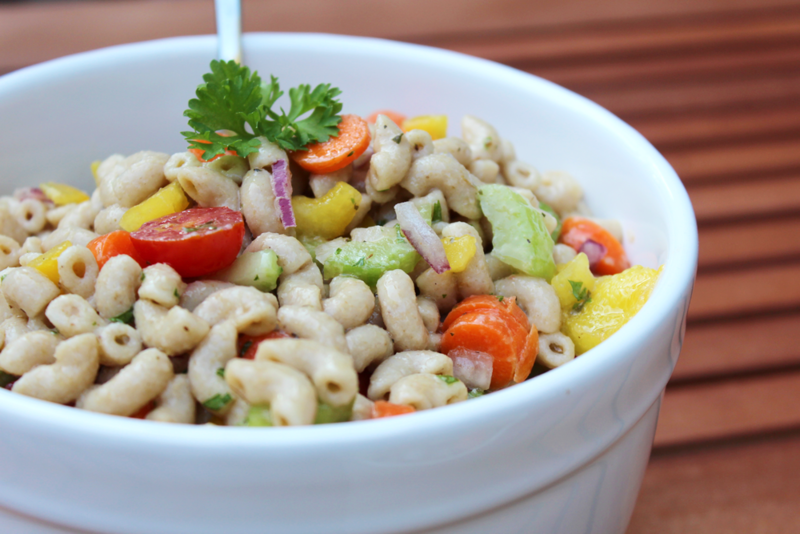 And here’s why…have you ever made your own dressing for a pasta salad? My husband and I are big fans of making our own sauces / dressings for just about everything. To us, a homemade sauce trumps just about any store-bought brand. It typically has more depth of flavor, contains fresher ingredients, no preservatives, and most importantly you can control the level of sodium much easier. This homemade Italian dressing for our Garden Veggie Pasta Salad is no exception. So fresh and vibrant, it made pasta salad come alive for me. So much so I am already thinking about my leftovers for lunch tomorrow! 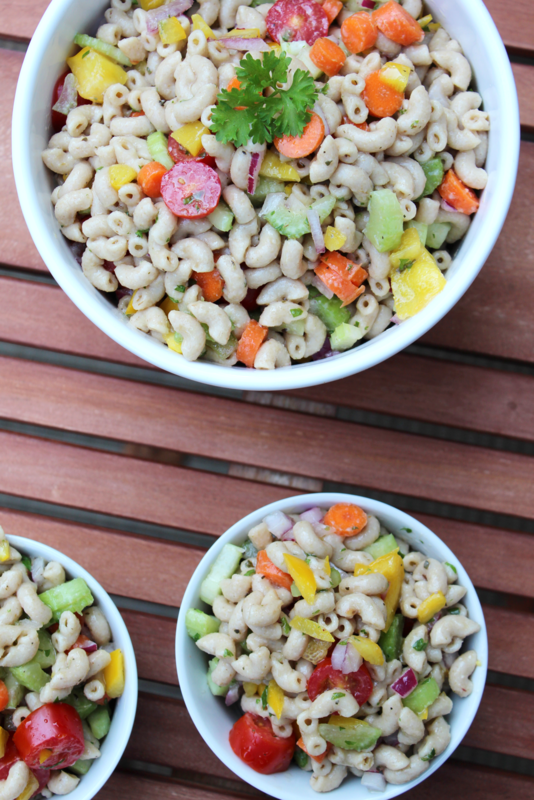 This Garden Veggie Pasta salad is loaded with so much goodness! You can always feel good eating food that is so colorful. 1. Cook the pasta according to the directions on the box – then let it cool. Just don’t rinse it! 2. Once the pasta has cooled, add the tomatoes, pepper, celery, carrots, red onion and parsley to the pasta and mix. 3. In a medium-sized bowl, whisk together the olive oil, red wine vinegar, Italian seasoning, garlic powder, and salt. Once well whisked, drizzle over the pasta salad until it is well coated. You can choose to let your ingredients cool together for 10-20 minutes to help the flavors all blend together if you’d like.